Once you get outside the Loop, works of art get more and more scarce. Fewer museums, fewer galleries, fewer public spaces hosting public works than inside the Loop. (The two airports are big exceptions to this rule.) But one thing that does pop up outside the Loop is highly eccentric art--art that doesn't fit into the categories a dedicated art-worlder like myself will expect. I like those surprises, like the cubes at the Sun Blossom apartments on Gessner or the Eclectic Managerie. I got another one of those surprises when I went to Gallery Furniture recently to buy box springs. 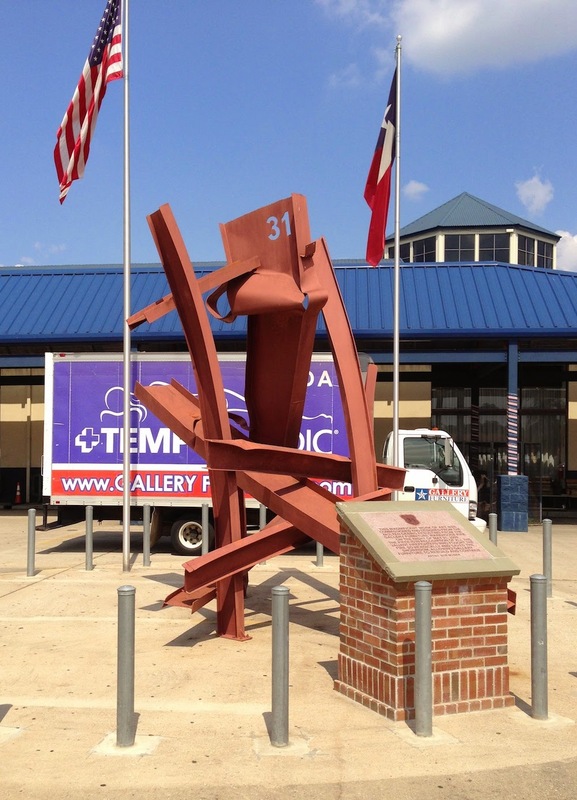 This abstract metal sculpture was the least likely piece of art I would have imagined ever seeing in front of Mattress Mack's temple of furniture. What was the story behind it? And what did the "31" at the top mean? The first thing that occurred to me was, this isn't bad! I've seen a lot of corporate plop art in my time, and it is usually pretty boring. Sleek and expensive, corporate plop is decidedly devoid of real meaning while simultaneously projecting wealth and power. It signifies "good taste" and modernity without challenging its viewers in any way whatsoever. 31 on the contrary has a loose-limbed, unbalanced stance. With its bent and twisted I-beams bending out from the center, it seems to be on the verge of falling apart. It has wit and the number "31" carved into the top, through which you can see the sky, adds a layer of slightly humorous mystery. So what does it mean? The granite plaque in front of it explains all. This fire was big news when it happened. The alleged arsonist was a former salesman at Gallery Furniture--he was ruled incompetent to stand trial in 2012. The "31" evidently refers to Fire Station 31 on Crosstimbers, whose firefighters were probably the ones who responded to this fire. It would be easy for a sophisticated fellow like myself to snicker at this, especially the self-congratulatory phrase "magnificent work of art". But in fact I totally approve of this. It's a nice work, a commemorative sculpture, remembering a destructive event and constructed from the remnants of the destruction. I wish there were more works like it in Houston. We all know how bad Houston is about commemorating (or even remembering) episodes from its own history. 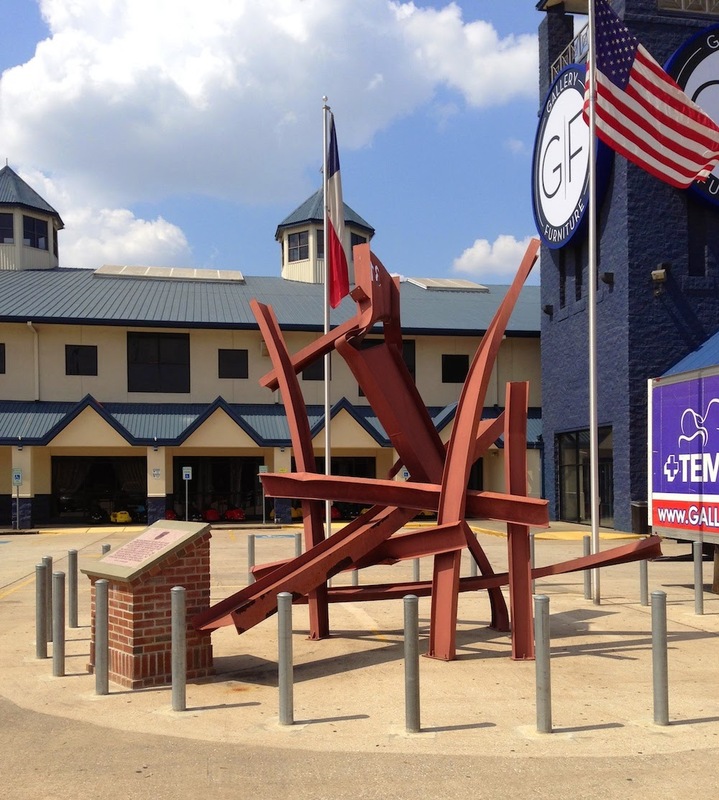 Gallery Furniture decided its warehouse fire was something that shouldn't be forgotten, and that their gratitude towards the firefighters should be expressed publicly. 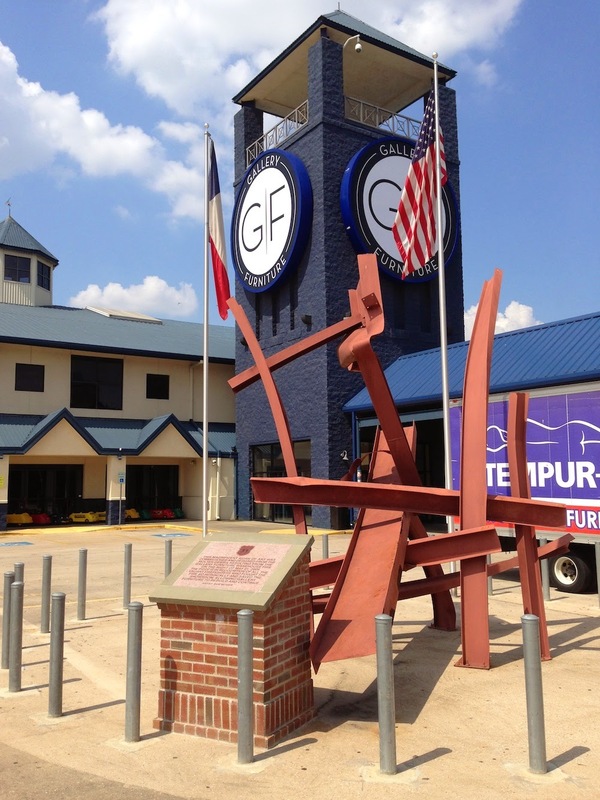 In the scheme of things, this warehouse fire wasn't a major disaster--no one died, thank goodness, and Gallery Furniture was able to stay in business despite their substantial losses. But from the point of view of the Gallery Furniture organization, it was a very important event. So why not commemorate it? Bob Mosier is an accomplished sculptor from Conroe who specializes in glass. This work is a little different from his usual work, but he used the unusual circumstances of the commission to make something interesting. I appreciate that Gallery Furniture used a local artist for this commission, but given Mattress Mack's Houston area boosterism, I would have expected nothing less. 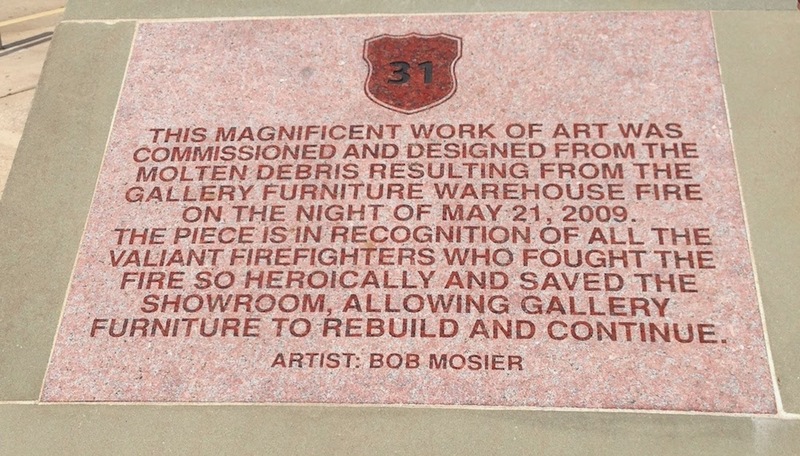 So if you need to do a little furniture shopping, stop by Mattress Mack's place and take a gander at Bob Mosier's 31.